I was doing one of my "routine" walks at Shoppers Drug Mart the past weekend and I came across a new display of Maybelline Color Show polishes, there were a few types: polka dots, holographic and I think the other was brights. I wasn't able to buy most but I thought these were quite fun! ** There's 2 more to this collection: Clearly Spotted (same glitter mix in a transparent base so you can do your own colour combos :) ) and Pretty in Polka (glitter mix in a pink jelly base). They were sold out already! Today I have for you: Dotty, Drops of Jade & Blue Marks The Spot. Blue Marks The Spot is the black and white glitter mix inside a milky jelly blue base. Three coats still shows a bit of VNL (visible nail line) but leaves it *just* opaque enough for a manicure. Not shown here but I took a really thin shimmer coat as base colour and the blue shows it off quite nice underneath the glitters! Dotty is the black and white glitter mix inside a squishy orange jelly base. Black and orange automatically makes me think of Halloween so at this moment I don't get the feeling of wanting to wear it so much. It's the least 'milky' out of the three so it has the brightest colour. Because orange is closer to my skin tone (bwahaha,, I'm not orange though), after 2 average coats the VNL is less prominent when swatching. But Dotty is not opaque enough until 3-4 coats with emphasis on glitter application. This is due to it being more of a clear jelly than a milky jelly. I also think if there was a shimmer as base colour, this would be quite nice as well. Last but not least, I have Drops of Jade. Drops of Jade is the black and white glitter mix inside a milky jelly 'jade' green base. This is hands down my favourite of the three! The green is eye-catching without it being too bright, the 'milky-ness' works well with the green, actually reminding me of a nice jade piece, something my grandma once gave me. I also think this green works well with the black and white glitters. I was able to swatch Drops of Jade on my hand before I got sick, so it's a bit more extensive (yay!). I REALLY like it by itself - it looks to have so much depth and layers, great glitter suspension and is really pretty! All things a good jelly polish should have. I tried it on top of other colours I had lying around the room just for fun and bleh, I really do prefer it on it's own. On it's own you don't see the streaky mess/uneven layers I made due to it's jelly nature. On other bases, you can't put on enough layers to show the depth of the glitter suspension without making it too thick. The only thing I could recommend, like the other two, maybe add a really thin shimmer layer underneath! On all nails - 1 coat Essie Grow Faster base coat, no top coat. Ring: Not too bad, still a nice overall green! Pointer: hmm eh.. I'd give it a 3/5, it's not too bad, but may look better with a brighter mint! & some colour-accurate close ups, I know in the bottle shots the orange looks super dark. I am just going to sum it up to it being sheer. How are you liking the colours? Do you prefer glitter mixes in jellies, or will you pick up Clearly Spotted and just make your own combos? I think it's really interesting that the 'non-indie' companies are really stepping up their game and bringing us a variety of finishes. I hope to see more later! never seen these before. I have found the green, pink, clear and the royal blue, but non of these. I need these! 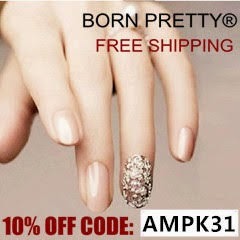 I dont really like these, they arent sparkly enough for me :( I like the ring finger the best too though! Well these are totally the perfect polishes for you!! I like black and white glitters as well!! if you find the clear one - Clearly spotted - you can definitely make your own combinations!! I would say try Wal-mart and Target. Unfortunately I got mine at Shoppers Drug Mart which I think are only in Canada so I would say the 2 stores I mentioned are your best bet! !